Tulipwood is a quality manufacturer and supplier of bespoke, custom made fitted bedroom wardrobes. Plus, a range of bespoke custom made bedroom furniture accessories. 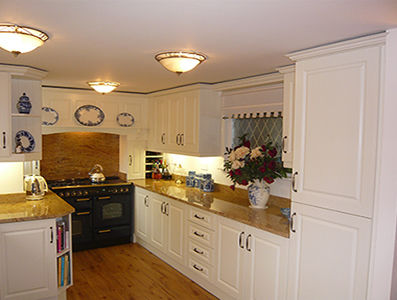 The company also produces bespoke fitted kitchen units, cupboards and worktops. Tulipwood is a well established, family run business which is situated in the Wombourne area of the West Midlands. The company is run by the hands on proprietor Robert Evans and his wife Debbie. Together with a team of time served craftsmen they are able to provide a first class design and installation service for all types of bedroom and kitchen styles. With over 30 years of actual experience, not only in design, manufacture and fitting, but also in sourcing the best materials from around the UK and Europe – Tulipwood is able to produce a product that will grace any home and any style. You are invited to select your dream bedroom or kitchen, in your own home, from the large range of samples – This way you can see what they look like in the room itself! Why not contact Tulipwood today and book your FREE AND NO OBLIGATION QUOTATION. We are happy to book evening and weekend consultations and usually work within approximately 30-40 miles of Wombourne. Please call 01902 89 22 77 for further details.